Fade and impact resistant plastic with key locks. 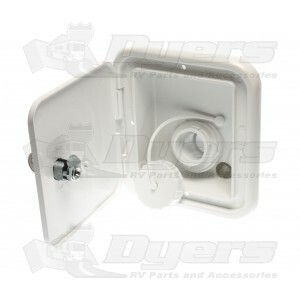 This gravity water fill is mounted in our durable plastic hatch with a key lock for added security. Hatch will not fade or discolor and is resistant to road salts and acids. Hatch is paintable to match any exterior. I recently upgrade to a larger fresh water tank and had to relocate the inlet fill tube. This unit worked perfect for what I needed and I do like the lock on the outer door.